We all know that I’m rubbish at blogging regularly but I’m finally back posting! I’m not going to promise to blog regularly because I’ll end up letting everyone down, including myself! 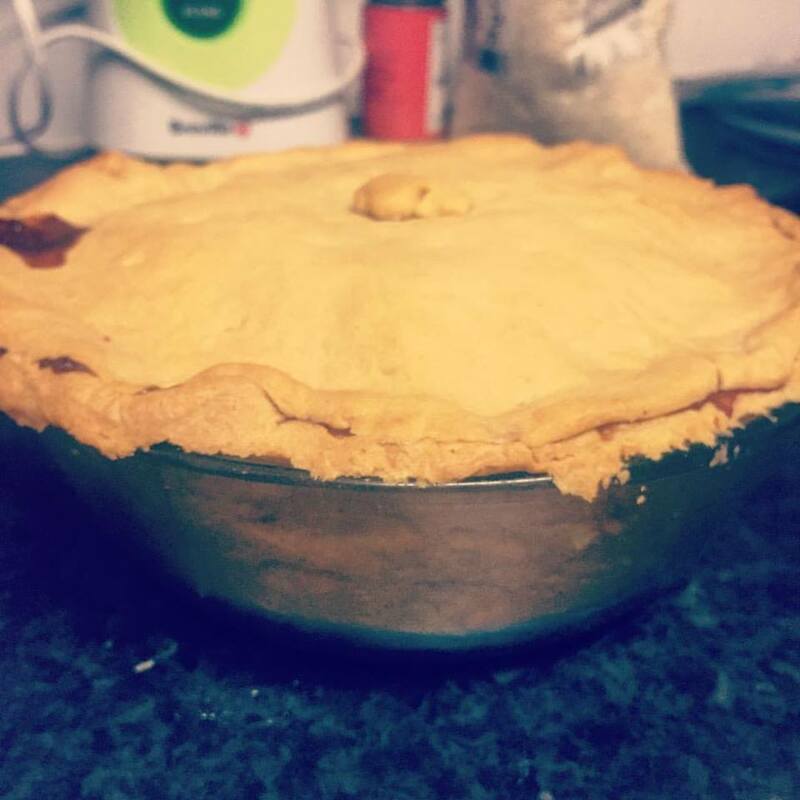 The other night, I had a hankering for something pastry based (probably due to the vast amount of Great British Bake Off I’ve been watching) so I thought I’d make myself a pie. Using bits and bobs I found in my kitchen, it went better than expected so I thought I’d share it with you beautiful people. Sift the flour into a large mixing bowl and add the ‘butter’. Using your fingertips, rub the ‘butter’ and flour together so that it resembles breadcrumbs. It works best if your hands are cold. Add the water and mix to create a firm dough. It usually gets to the point where you have to bring the last bits together with your hands. Knead the dough together, wrap in clingfilm and put it in the fridge whilst you get started on the filling. Fry the onion in a tablespoon of coconut oil on a low heat. When the onion is starting to go a bit brown, add the rest of the ingredients (apart from the fresh spinach) and simmer on a low heat for about 20 minutes, or until a lot of the liquid has reduced down. Whilst the filling is simmering, roll out the pastry to line your dish, leaving enough to make a lid. I used a small glass Pyrex dish so it made a smallish pie. Prick the bottom of the pastry base with a fork a few times. You’re going to want to blind bake the pastry so to do this without any fancy baking beans, put greaseproof paper over and mould it to the shape of the pastry base. Pour in some dry rice so it weights it down. Pop it in the oven for about 15 minutes or until it goes slightly golden. Take the greaseproof paper and rice out, then pop it back in the oven for about 3 minutes. When the filling has reduced down, pour it into the pastry base. Put one layer of fresh spinach over the filling, covering it completely. Using the remaining pastry, roll out a thin lid to put over the pie. Prick the top of the pie before putting it into the oven. This allows air flow. Turn the oven down to 170ºC and bake slowly for about 30 to 40 minutes or until golden brown and the top sounds hollow when you tap it. Voila! You should now have yourself a tasty pie! If any of you do try this out, please let me know how it goes and any suggestions to improve or adapt the recipe would be greatly appreciated!